The menu at the Bistro only hints at some of the Asian fusion cuisine that has made Frederick Costa’s original, eponymous restaurant on Broadway such a long-time favorite. 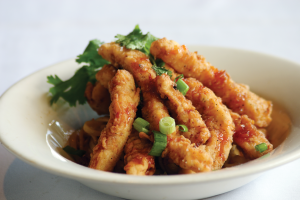 The crispy calamari over spicy Chinese noodles are one of those hints. They are also almost irresistible, despite the hint of ennui that sets in at the sight of calamari in any form these days. Dining Companion did allow as how she thought the noodles a little chewy, but let’s call them al dente and be done with it, for the deftly breaded calamari themselves were tender-crisp and the chili sauce punchy-sweet. The dish belongs to no culture, yet sits comfortably in our own. 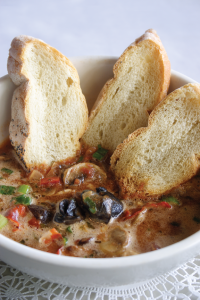 The escargots Bourguignon with Spanish chorizo also blend cuisines and to even better effect. “I could eat this and this alone,” sighed DC as she battled me for the remains of the savory sauce with bread from the napkin-enveloped basket. There’s no fooling around with unnecessary shells in this dish, no blast of garlic and butter so strong that it would disguise dog food. Just earth and spice and a plea for a very lusty wine. Which might be answered with one or two of the bottles on the list, but by and large the selection is nowhere near as imaginative as the cuisine, especially when looking for wines by the glass. The presence of an enclosed wine room in the dining space generates expectations, but we ran through most of the whites of interest at the time (Pine Ridge, Chalk Hill, even Kendall Jackson Reserve) and hoped that the Joel Gott cabernet might weigh in with some heft. 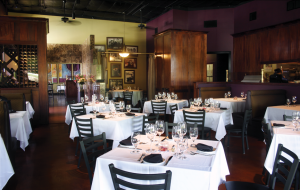 The menu’s main entrées could be considered a sampler of contemporary, upscale cuisine: stuffed, grilled chicken breast; duck leg confit; rainbow trout with baby shrimp; grilled lamb chops; grilled Prime rib-eye; lobster two ways. There’s nary a hint of off-putting innovation, nothing to challenge the diner in search of a well-executed meal that didn’t require a subscription to Saveur or Bon Appetit. 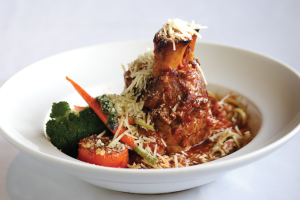 The Korubuta pork shank, “osso buco style,” arrived erect and impressive on its plate and spoke of nothing more than bounty. Bounty, however, can be both a blessing and a curse. In addition to the stalwart shank, there was a nest of basil-Parmesan fettuccini (skinny enough to seem more like linguini) in an intense sauce with tomatoes and mushrooms. The day’s vegetables — beautifully colorful and very simply treated — added to the picture. The shank itself provided a lesson in porcine anatomy: Part of it was slightly stringy, the rest extremely tender. Many of the dish’s components were good, but the whole seemed to be searching for a focus. The intent of the sea scallops in lemon caper butter sauce was much more apparent, with little to distract from a dish that depended on perfect product and a deft hand. The hand was to be had in a sauce that was generously capered yet not briny, and scallops that seemed to have been sautéed to perfection, as more exuberant menus are fond of claiming. And yet, despite the obvious skill in preparation, the scallops were spongy in texture. We might have been helpfully distracted in this case by a little more roasted garlic in the mashed potatoes, but that flavor remained discreetly in the distance. It’s apparently an early, weekday crowd at Frederick’s Bistro; by dessert time it had waned considerably, though the remaining diners populating the handsomely paneled space — some in shorts, others in coat and tie — kept up an appreciative level of conversation. They might have been marveling at the desserts for all we know. At least we were. It’s often that appetizers and desserts rise above the level of the entrées, and in this case we both came in and went out with a bang. Both the floating island and the apple crepia are old friends from Frederick’s and L’Etoile, and as with good friends, it was a pleasure to encounter them again. Presented in the one piece of overtly dramatic serving ware we noticed, the poached meringues of the floating island were strewn with slivered almonds and drizzled with a caramel sauce; there was just enough crème anglaise to buoy them adequately, and to slice through the clouds was exquisite pleasure. Yes, I might have plumped for a little more puff in the crepia’s pastry, but this triumph of simplicity, served with delicate, jasmine tea-scented ice cream, never fails to please regardless. There may be much to be said for innovation, but dependable excellence is often its equal. If not its master. The crowds have apparently figured that out.